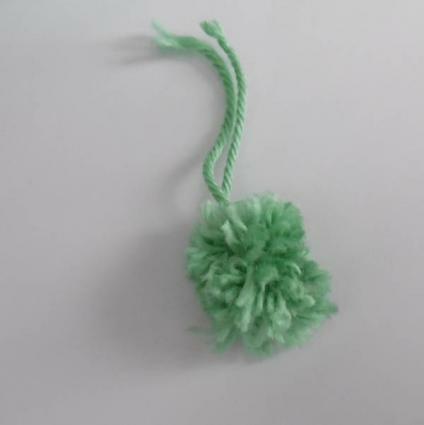 Yarn pom pom keychains are quick and inexpensive craft projects. They are great to make as a group activity or as a homemade gift for friends and family. This basic pom pom keychain is a cute and colorful way to make sure your keys are always close at hand. 1. Create your pom pom using a template, fork, or pom pom maker. For this project you'll want fairly small pom poms. When you're finished, remember not to cut the tail at the end after tying it off. You'll need this extra yarn to tie the pom pom to your keychain. 2. Tie the pom pom to your keychain as tightly as you can. Trim off the excess yarn. You can trim close to the edge or leave a bit of yarn to make a mini tassel for your keychain. If desired, reinforce the knot with a dab of clear nail polish to prevent it from coming loose. 3. Add any ribbons or charms that you want to include in your design. 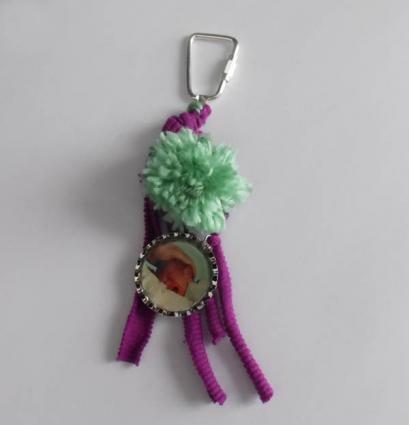 If you're making keychains to give as a gift, try making pom poms in the recipient's favorite colors and adding charms with family photos or images that represent any special interests they have, such as reading, scrapbooking, or riding horses. This completes the keychain project. Using the same basic instructions for the pom pom keychain, you can create a variety of different looks. Try some of these fun variations. You can make a monster pom pom keychain by gluing wiggle eyes to your pom pom and adding tiny felt feet with fabric glue. These keychains are a little more fragile than a basic pom pom keychain, however. It would be best to clip them on the outside of a purse or backpack so they're not being constantly jostled around. The Purple Pug has a few different monster examples to help you get started. If pretty flowers make you swoon, consider creating a keychain with a flower made from nine pom poms. String together eight small pom poms in red, pink, or purple to make a circle. Run a thread through a slightly larger yellow, white, or brown pom pom to attach it to both sides of the circle. Pull tight to make a flower, then tie the flower onto your keychain finding. For details, review the tutorial on the Repeat Crafter Me website. Traditionally, pom poms are round. 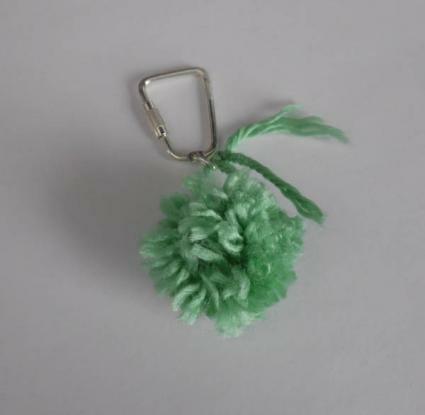 If you want to make something unique, however, you can try making a square pom pom keychain. Make one large pom pom, then use sharp fabric scissors to trim it into a square shape before tying it to your keychain. Square pom poms also make a fun party garland, as shown on the South by North website. With so many different pom pom keychain designs available, you may find that you can easily create a different design for every possible mood or occasion. Have fun experimenting and be prepared for compliments as others notice your distinctive handmade keychain!